I don't know about you, but I was pretty disappointed when the old GW washes were discontinued. Badab Black and Devlan Mud were pretty key in my painting. I've been seeing my pot of BB slowly diminishing and knew I had to bite the bullet and find a replacement, so I ordered some washes from Maelstrom Games and tried them out. The ones I tried were Nuln Oil (GW), Dark Tone (Army Painter), Black Shade (Vallejo) and obviously Badab Black as a comparison. 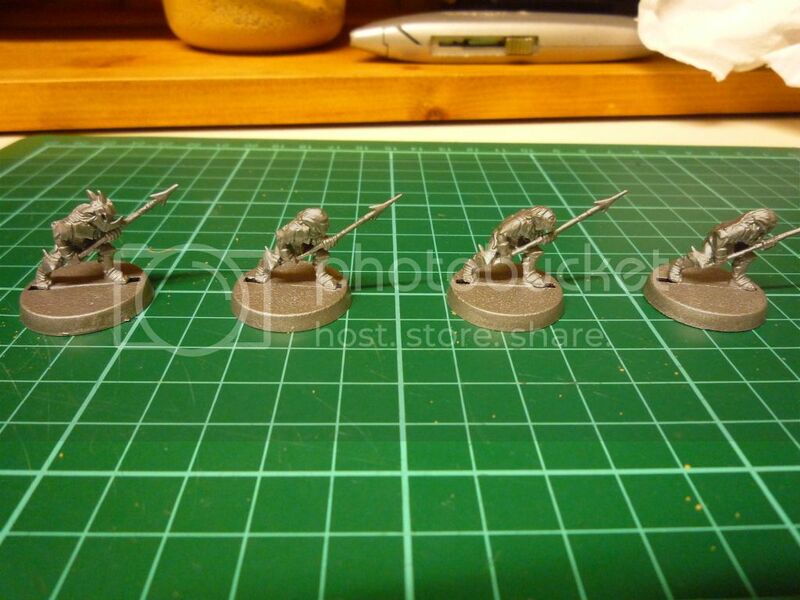 I sprayed 4 goblins silver using Army Painter Plate Mail, and then gave each a quick base coat in my Moria scheme. I then applied the washes over the whole model to see the effect on normal paints and metallics. Dark Tone (Army Painter): Looks the same as BB in liquid form. Is slightly softer in effect than BB, so where details on the model weren't great it looked a bit indistinct. The effect on the metal was very similar to BB (which I love). The overall finish was slightly glossy. 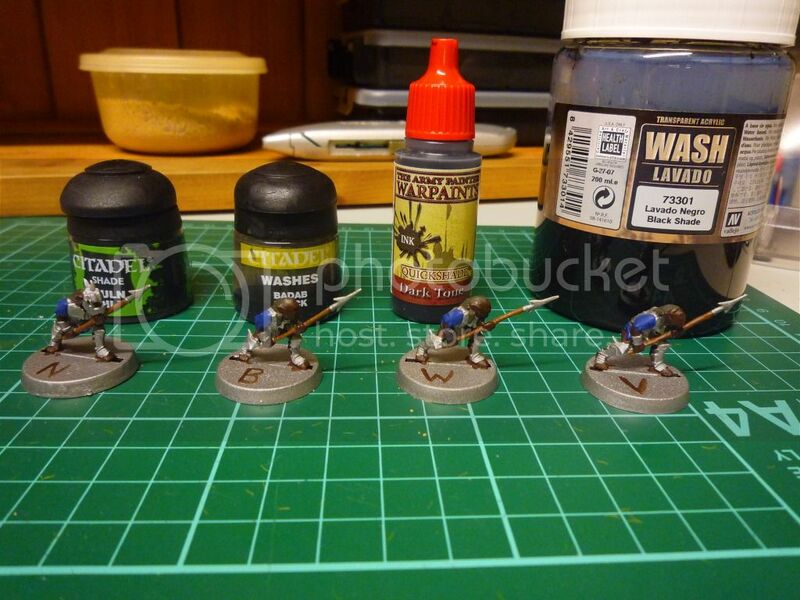 The bottle is a dropper bottle which I really like for normal paints but actually prefer a normal pot for washes. This may end up in my old BB pot when it is empty. Nuln Oil (Games Workshop): Initially made the whole model look a lot darker than the others and also took much longer to dry than the other washes. It gives a slightly glossy finish and doesn't give quite such clear contours as the Vallejo, but is clearer than the Army Painter. It gives a decent finish on the metallic areas, although not as nice as BB or the Army Painter wash, and the normal paint areas look better than the Army Painter, but not as clear shadows as the Vallejo. I actually think that at least two of these will find a regular use in my painting. 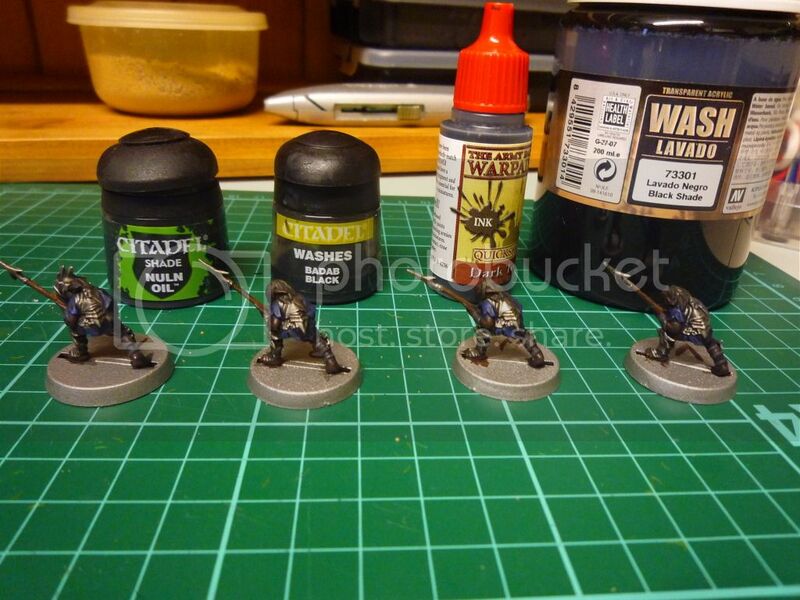 The Army Painter wash will be used on metals, whereas the Vallejo will be used on other paints. 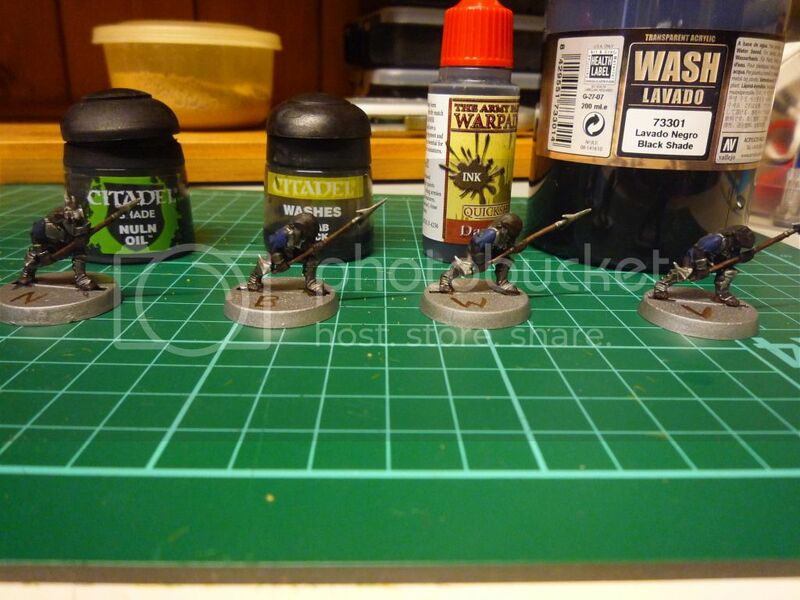 The Nuln Oil does a decent enough job as an all rounder and will suit some people who only want one black wash, or who only want to shop at GW. If I had to choose just one I would probably go for the Vallejo wash as the price would just tip it over the edge for me - such great value! Thanks for posting this. I'm still using my old Badab black wash which is great stuff but already have an unopened nuln oil and was wondering what the finish would be like on it. Nuln oil dries glossy huh? Guess that will be staying unopened then. I will buy some Vallejo. Thanks You. Daniel - my next job is to try some DM replacements. The army painter option looks good though. Thanks for the link. I was sold an Army Painter DM replacement (Soft Tone I think). Hits the spot for cream colours but the dropper bottle is not as good as a pot. Fortunately a well has formed on my palette which holds it perfectly. Good stuff, I'll have to get some Vallejo Shade. I got Agrax Earthshade and it's the same as the Nulun Oil, too shiney for my taste. thanks.